Following in the same vein as popular sibling acts such as the Delmore Brothers, the, Callahan Brothers—consisting of the duo of Homer and Walter (who later adopted the sobriquets Bill and Joe for the sake of brevity)—made a name for themselves in the budding country music industry of the Great Depression-era. Hailing from the Blue Ridge Mountains of western North Carolina, in the county of Madison, Walter Callahan, born January 27, 1910, and his brother Homer, born March 27, 1912, grew up surrounded by the rich musical culture of the mountain folks. 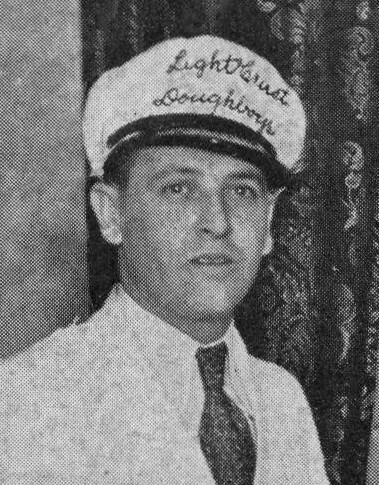 As they were in adolescence, the soon-to-be-famous Jimmie Rodgers was getting his start singing on the radio in nearby Asheville, and in the year of the Singing Brakeman’s demise, 1933, the Callahans got their own big break in the very same town. 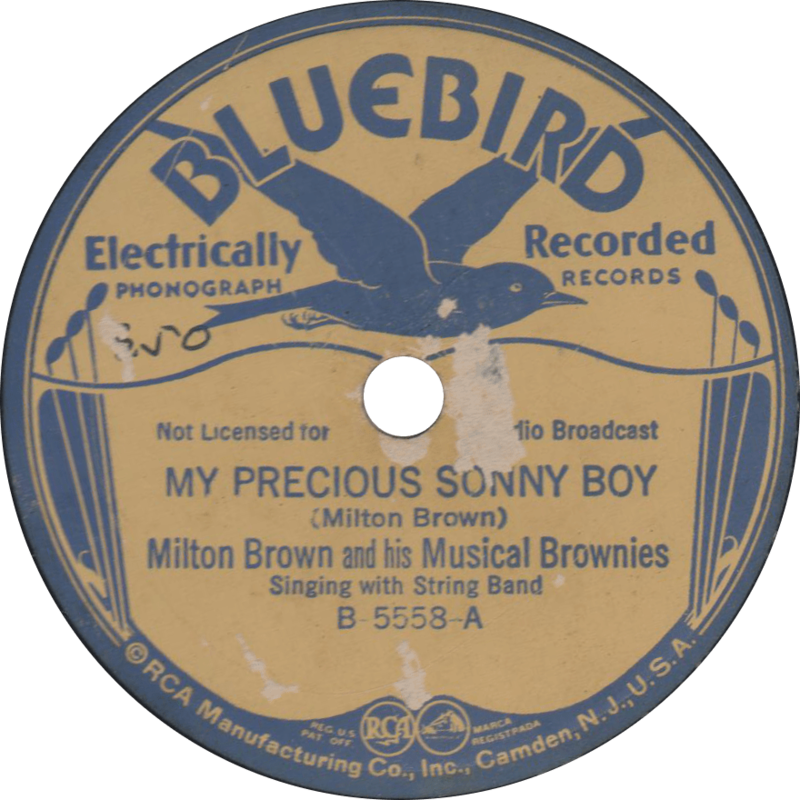 While singing and yodeling at an Asheville music festival, the brothers were discovered by a talent scout for the American Record Corporation, who invited them to New York for a session. 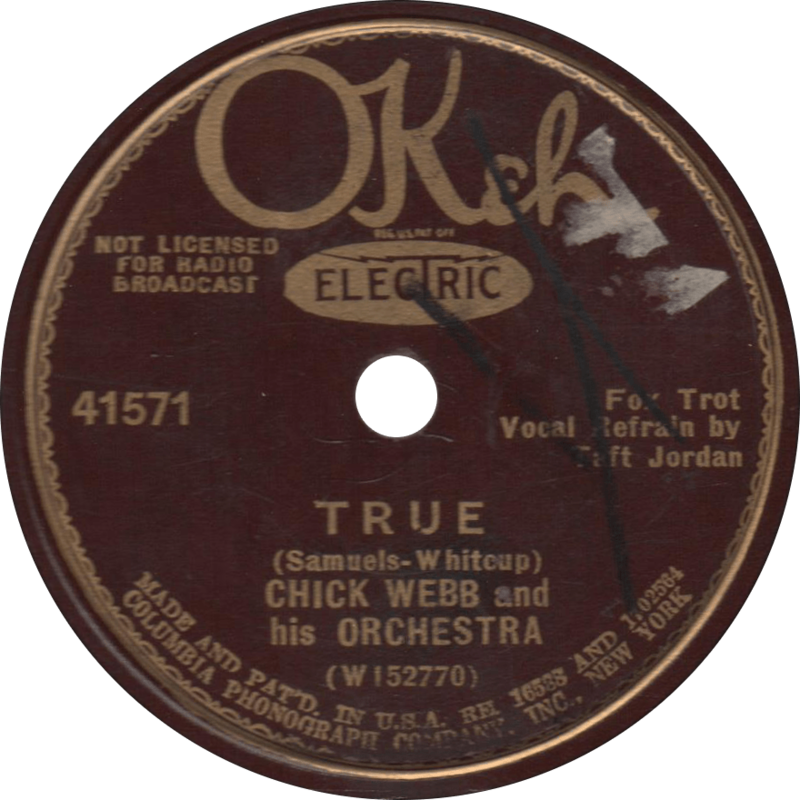 They obliged, and had their first record date on January 2, 1934, a session which produced a hit with “She’s My Curly Headed Baby”. With a two-guitar accompaniment and a repertoire consisting of old sentimental songs such as “Maple On the Hill” to hokums like “Somebody’s Been Using That Thing” to straight blues like “St. 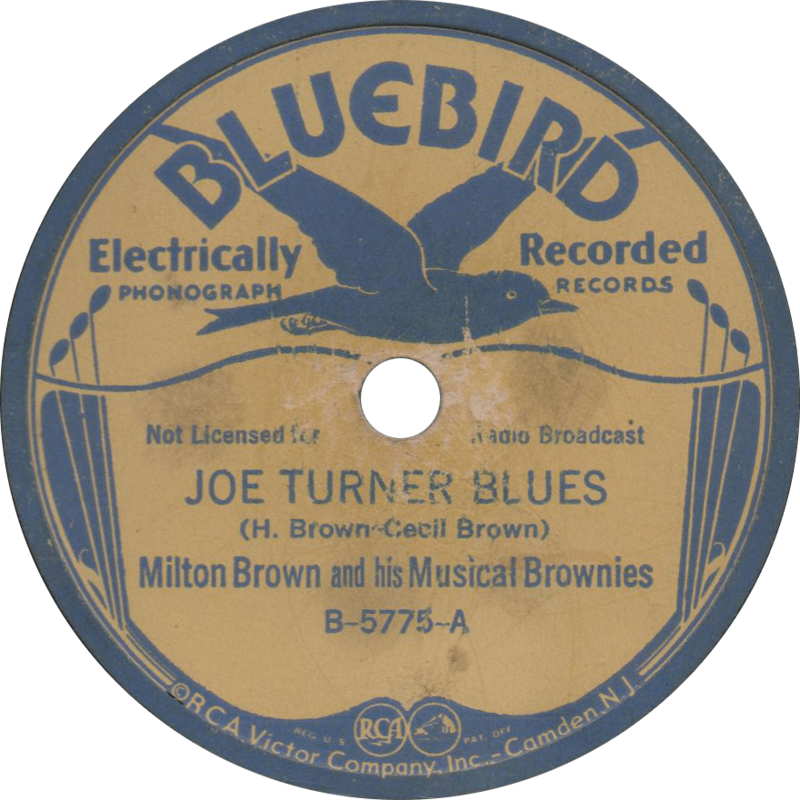 Louis Blues”, they were able to produce a string of decently selling records during the times of economic depression. In addition to their work as a duet, the brothers also each recorded solo. Around the time of their recording debut, the duo also began appearing on Asheville’s WWNC, soon moving to WHAS in Louisville, and then to WWVA in Wheeling, West Virginia. Walter retired back home for a brief period in the late 1930s, leaving brother Homer to continue solo for a time. Reunited at the end of the 1930s, Walter and Homer changed their names to Joe and Bill, respectively, and went to Texas to begin performing on KRLD in Dallas. There, they became early members of the station’s Big D Jamboree when it debuted in the late 1940s. They also recorded transcriptions to be played on the Mexican border blaster stations, bringing their music to an even wider audience. In 1945, they made an appearance with Jimmy Wakely in the Western movie Springtime in Texas. They continued singing on the radio and on records into the 1950s. Also in the 1950s, Homer/Bill worked as manager to Lefty Frizzell. Walter/Joe retired back home once again by the end of that decade, this time for keeps, and became a grocer. He died in North Carolina on September 10, 1971. Homer stayed in Texas and in music for the rest of his long life, which came to an end on September 12, 2002. 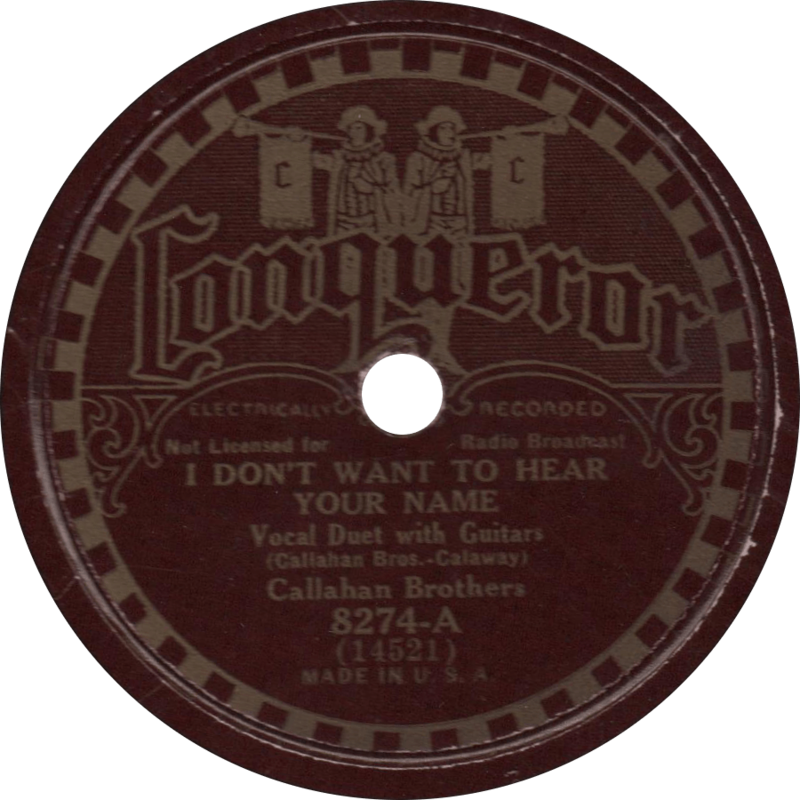 Conqueror 8274 was recorded In New York City on January 3 and 2, 1934, respectively, the Callahans’ first sessions. Homer and Walter Callahan sing and yodel, accompanied by their own two guitars. From the second day of the Callahan Brothers’ first sessions, the duo sings and yodels the lonesome song “I Don’t Want to Hear Your Name”. I Don’t Want to Hear Your Name, recorded January 3, 1934 by the Callahan Brothers. On the reverse, the brothers sing a hot hillbilly take on W.C. Handy’s famous “St. Louis Blues”, cut on their first record date. 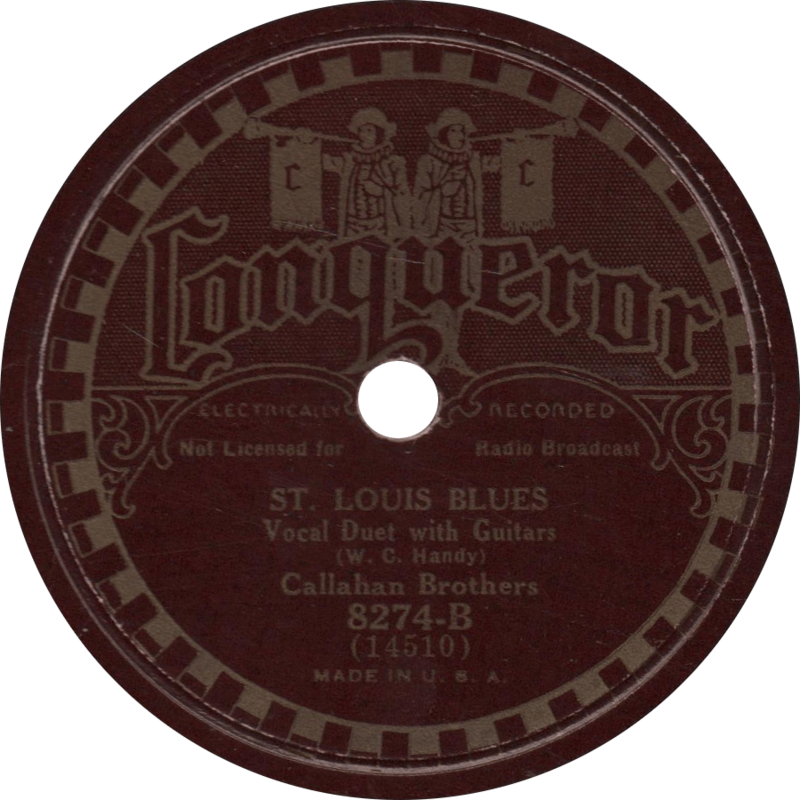 St. Louis Blues, recorded January 2, 1934 by the Callahan Brothers. Few old time “hillbilly” string bands of the 1920s and ’30s left behind such illustrious and distinguished legacies (and darned good music, too) as Gid Tanner and his Skillet Lickers. From their first recordings in 1926, Tanner’s Skillet Lickers established themselves as one of the most commercially successful “hillbilly” bands of the decade. But as the twenties ceased to roar giving way to depression, the record industry quickly faltered, and so did the recording oriented Skillet Lickers. 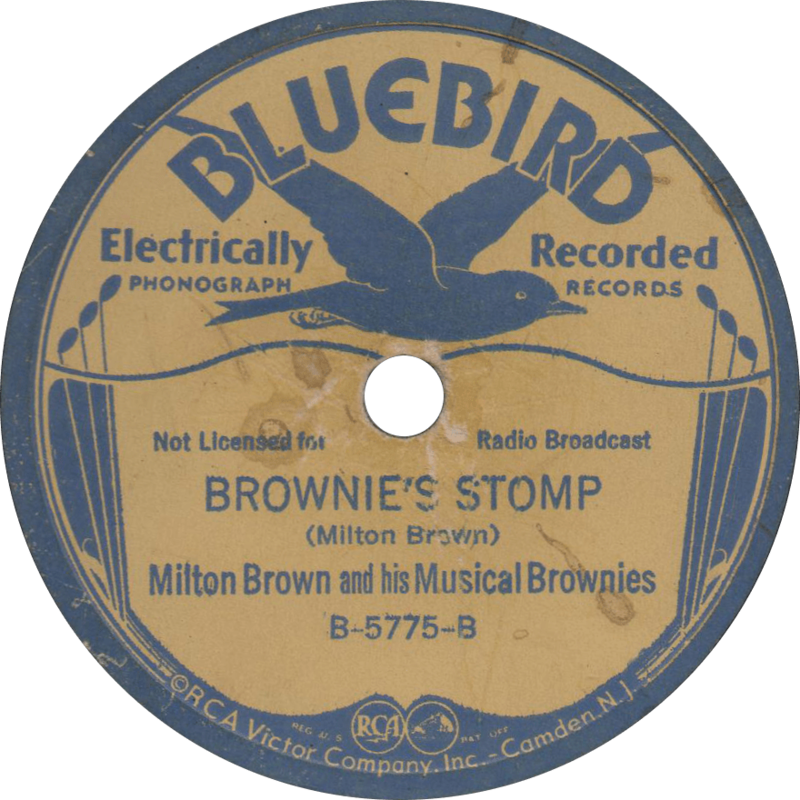 The band had their last session for Columbia Records—with whom they had recorded exclusively since their first session—in October of 1931, and broke up thereafter. Fiddle player Clayton McMichen went on to form his Georgia Wildcats and found success on radio and records through the remainder of the decade. Come 1934 however, Gid put together a reunion of sorts. Together with his son Gordon Tanner, old pal Riley Puckett, and mandolin player Ted Hawkins, they traveled to San Antonio, Texas, where the RCA Victor Company was holding a series of recording sessions at the Texas Hotel. There, they recorded in two sessions on March 29th and 30th a series of twenty four sides, mostly energetic and jubilant dance tunes in stark contrast with the hard times the nation was then facing at the depth of the Great Depression, concluding with two of their classic “skit” records: “Prosperity and Politics” and “Practice Night With the Skillet Lickers”. 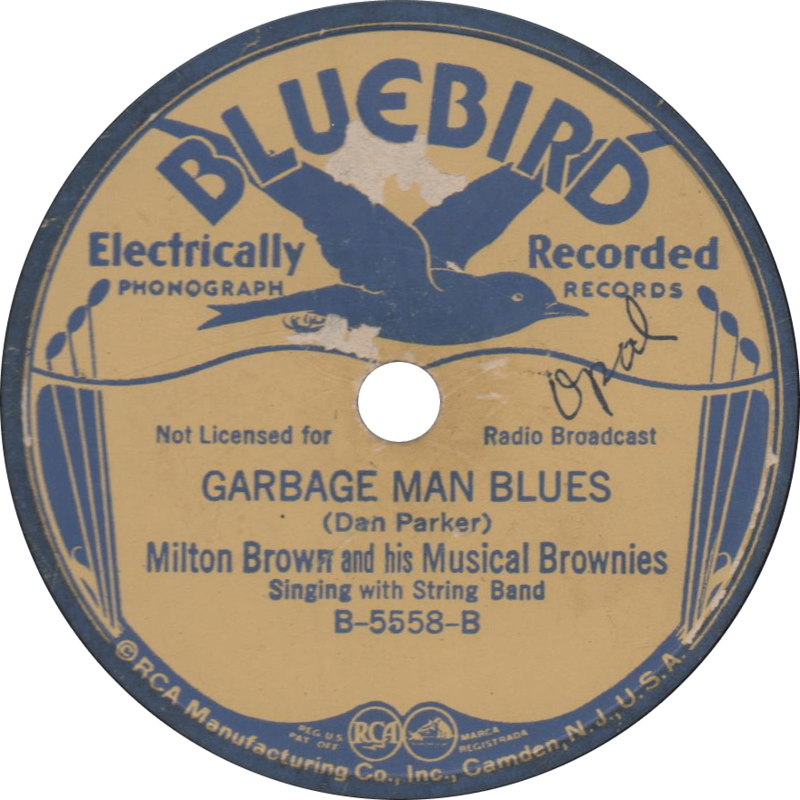 Bluebird B-5433 and B-5562 were both recorded on March 29, 1934 at the Texas Hotel in San Antonio, Texas—the same time and place Riley Puckett recorded his famed solo performance of “Ragged but Right” and others. The former was released on April 18th of that year, and the latter on July 18th. B-5433 was also issued concurrently on Montgomery Ward M-4845, and B-5562 was reissued widely throughout the following decades on RCA Victor 20-2167 and 420-0569, making it all the way into the 45 RPM era on 447-0569. The Skillet Lickers are Gid Tanner and his son Gordon Tanner on fiddles, Ted Hawkins on mandolin, and Riley Puckett on guitar. On B-5433, the Skillet Lickers play two old time fiddle standards, both tunes which they recorded previously in 1930 and ’29, respectively. 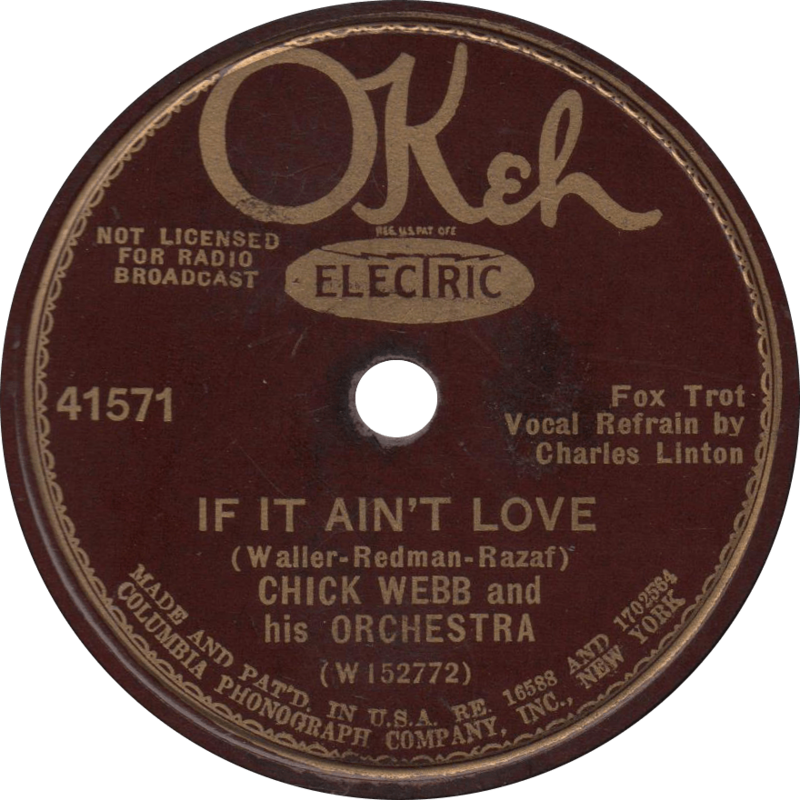 First it’s “Georgia Waggoner”, the first side they recorded at the reunion session. Georgia Waggoner, recorded March 29, 1934 by Gid Tanner and his Skillet Lickers. Next, keeping in the same theme, they follow with one of my personal favorites, a high energy rendition of “Mississippi Sawyer”, punctuated by Hawkins’ mandolin. The band members can be heard talking over the music, lending to an informal atmosphere. Mississippi Sawyer, recorded March 29, 1934 by Gid Tanner and his Skillet Lickers. On B-5562, the Skillet Lickers first play that old 1921 L. Wolfe Gilbert standby, “Down Yonder” (which we last heard played by an unidentified pianist). This might just be my favorite Skillet Lickers side; I like their 1934 sound with the added mandolin, even though the old mainstays like Clayton McMichen and Fate Norris are absent. 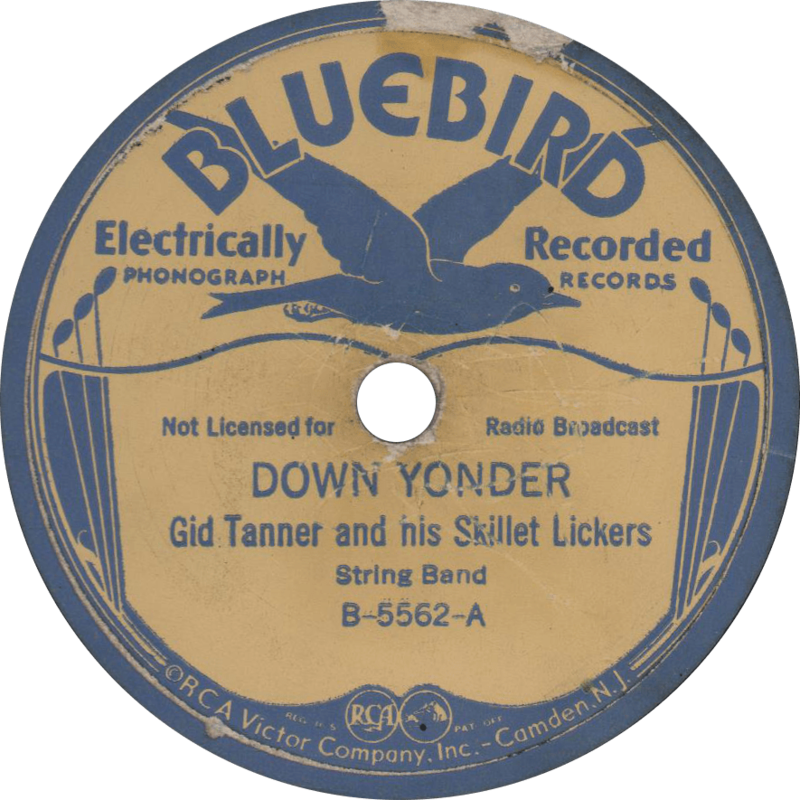 Down Yonder, recorded March 29, 1934 by Gid Tanner and his Skillet Lickers. Then, they play another utterly bright and feel-good tune, the traditional fiddle piece “Back Up and Push”. Though not credited as such in Russell’s Country Music Records, I’m quite certain Riley Puckett’s voice can be heard on this side, hollering some of the calls (“now ladies in the center and gents catch air, hold ‘er Newt, don’t let ‘er rare”). 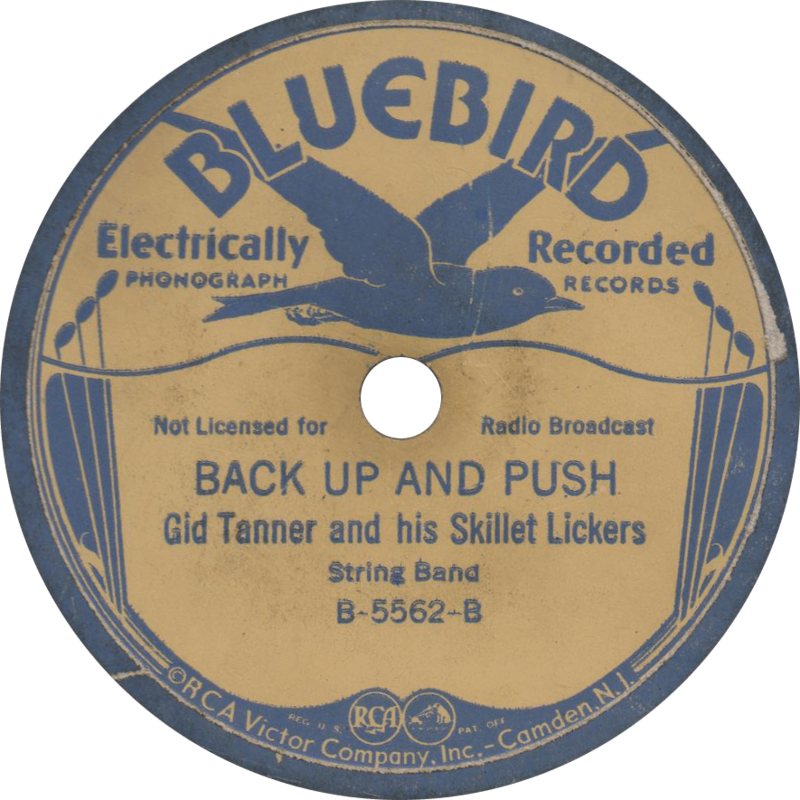 Back Up and Push, recorded March 29, 1934 by Gid Tanner and his Skillet Lickers. An old board roof and a puncheon floor, an old pole bedstead, and oak-board door. Sleepin’ on the slats with a handful o’ straw, tryin’ to get along with my mother-in-law.